One of the biggest hair-related complaints out there is lack of volume, and it’s easy to understand why. Why settle for a thin, lackluster mane when you can have big, hair flip-worthy locks instead? The good news is that giving your strands a volume boost isn’t impossible. Whether you were born with naturally thin hair or have smooth hair that lies flat, there’s a solution (or two, or three!) out there for you. Ready to cheat your way to more voluminous hair? Below, we’re sharing expert volume-building tips and tricks that can help you fake fuller hair. To help give your hair the appearance of more volume, rely on layering. During your next haircut appointment, ask your James Geidner stylist to cut layers into your lengths. This simple technique can reduce some of the weight of your hair and bring forth the volume you desire. Did you know our color artists can help you create the illusion of voluminous hair with hair color techniques? It’s true! Certain hair color techniques incorporate tonality and depth and can create the effect of a volume-rich mane. Talk to us about which technique would best suit your hair. We could choose to create light and shadow throughout your hair with balayage or incorporate highlights on the front of your hair to add texture and dimension. Our skilled colorists will know the best technique to use that will give the impression of more volume. It’s no secret that one of the fastest ways to achieve a voluminous mane is with volumizing hair care and styling products. From volumizing shampoos to thickening mousses, there’s no shortage of options out there to choose from. 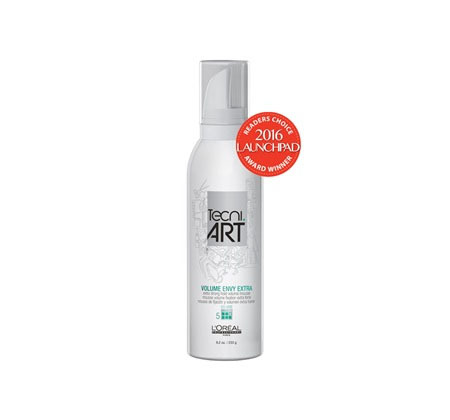 Scan product labels and reach for products formulated to add volume to the hair. Start by using a volumizing shampoo and conditioner. Prior to styling, apply a volumizing mousse, like L’Oreal Professionnel Volume Envy Extra, to towel-dried hair. To lift at the root, reach for L’Oreal Professionnel Densité, a thickening primer that can provide hair with density and fullness. Just be careful not to overdo it, since applying too many products at once can weigh your hair down and create the opposite effect. When styling your hair, opt for hairstyles that add extra oomph to flat, lifeless strands. Try a bun with volumized roots or a half-up half-down look with backcombed roots. Not only are these styles day-and-night appropriate, they will easily make your mane the center of attention! Top tip: After styling, spritz your hair with some hairspray, like L’Oreal Professionnel Infinium 4. In addition to helping lock your style in place and taming flyaways, hairspray can provide a bit of texture and lift-making the hair feel thicker without being sticky. Teasing (or backcombing) your hair gives instant volume to any length of hair. Start by taking a small section of hair and using a comb to backcomb toward the roots. Remove the comb and repeat until desired height is achieved. If you’re not sure how to tease the right way, it’s best to ask us during your next appointment rather than risk damaging your hair.